Thank you Gemmy for sending free product to review for this post. All opinions are 100% my own. Have you guys checked out the holiday merchandise at Lowe’s Home Improvement yet? If so, maybe you happened to notice that they have a whole magical line for Disney lovers?. You can bring home the magic of Disney this Holiday Season with the Disney Magic Holiday collection available at Lowe’s Home Improvement. 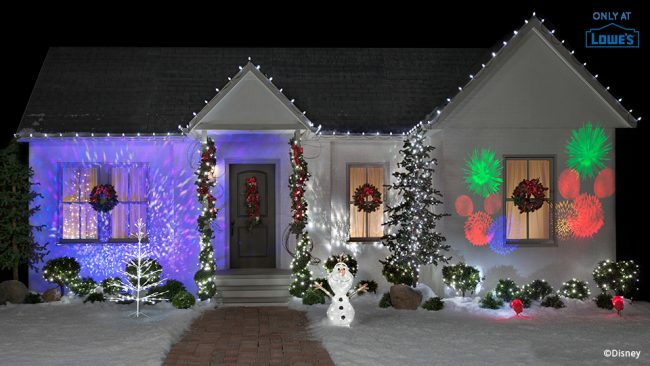 This is the amazing Disney-themed holiday lighting and yard decor line introduced last year. They have light projection shows, lights, yard decor and more. The items in the line are energy efficient and use safe LED lighting. Last year I was able to review the projectors. You can find that review included at the bottom or this post. This year, I was excited when they asked if I would like to review another item. They sent me 3 sets of the Mickey Mouse lights. 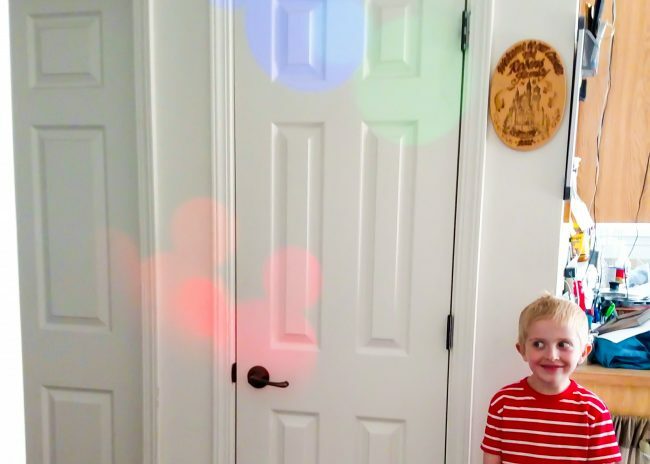 My kids fell in love with these and ask for “Mickey Lights” every day! We used ours to decorate our patio area, but they would look great around the edge of your home, around a room, and more. They are pretty big though, so I probably wouldn’t try using them on a tree. The lights are on 23 foot strands. They can be connected easily to make longer strands. My favorite thing is that these lights are a light show. The lights will change color, blink, fade, etc. They rotate through the different options. The LED lights stay nice and cool too. These are probably my favorite item of the Disney Holiday Magic collection! Be sure to pick some up at Lowe’s Home Improvement! Keep reading to see my review from last year of the light projectors! I personally love the light projectors. From the countdown to the Disney themed firework show, they are great! I was lucky enough to get to try out the Fantastic Flurry light projector. Let me tell you, it is so fun! First, the projector is so easy to use. It connects to a stake that you can push into the ground, and then you just plug it in and it projects Mickey Mouse heads onto your house. Super easy and super magical. It is so easy that even my six year old can do it. In fact I often times come out to find he has it on in the living room. I tried it out outside this week. Now, there aren’t any other Christmas lights up (should probably get on that) but you can see how the projector works. 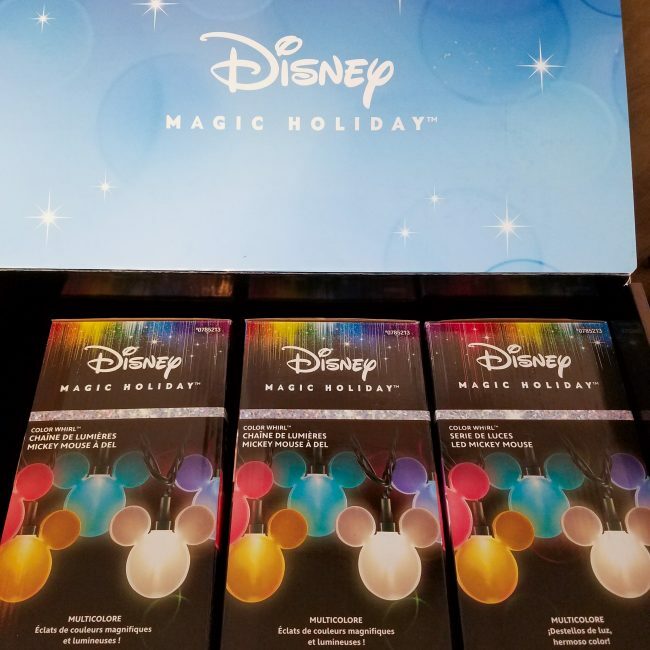 I am so excited to have yet another way to add a little Disney Magic to my Holidays this year. I am going to be heading to Lowe’s to pick up a few more items from the Disney Magic Holiday line. You can head to all Lowe’s Home Improvement locations to pick up items from the line or visit Lowes.com. We bought the Disney fireworks. I really want the flurry! We stopped by lowes today but they were sold ourlt of the flurry. Love this line of decorations!!! We are looking to buy a projector this year to go on the side of our house (my husband thinks he’s Clark Griswold…and he kind of is, lol). I had never seen the Disney one, but I definitely want one now!!!!! Thanks for the giveaway! I love this collection. I’m sad that it sold out at our Lowes before I even know about it. This is the perfect compliment to our holiday decorations! The string lights and projector are awesome! I love the whole collection! I need to go to Lowe’s! 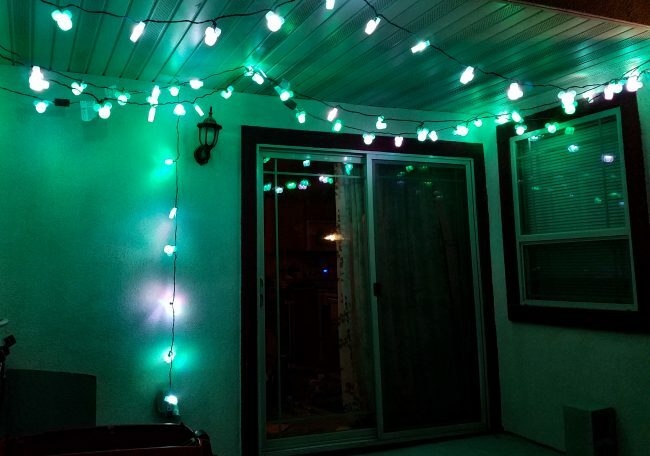 These lights look so fun – what a great giveaway. Good Luck Everyone! I love the Fireworks LED Projection Spotlight.. Very fun. Stopped by Lowes yesterday. Such a fun line. I love it all, because it’s Disney! But my favorite is probably the musical light show. We have no outside Christmas decorations, I’d love to win these! I am adding some new lights this year to indoor and out so this would be super fun out near the kids bedroom windows. This is on my Disney gift guide this year and I totally want one myself! This is DEFINITELY something I’d love to add to my holiday display! SO CUTE! Perfect for our crazy Disney-loving family! I need all of these in my life! I think the fireworks are my favorite. Would love to project those on to the house for the 4th of July too! i need to stop an Lowes and check out the full collection!! Love these Disney holiday decorations!! I love the fireworks projections! There is so much that I want! I really like the look of the Color Whirl Mickey heads. My nieces would LOVE this!!!!! 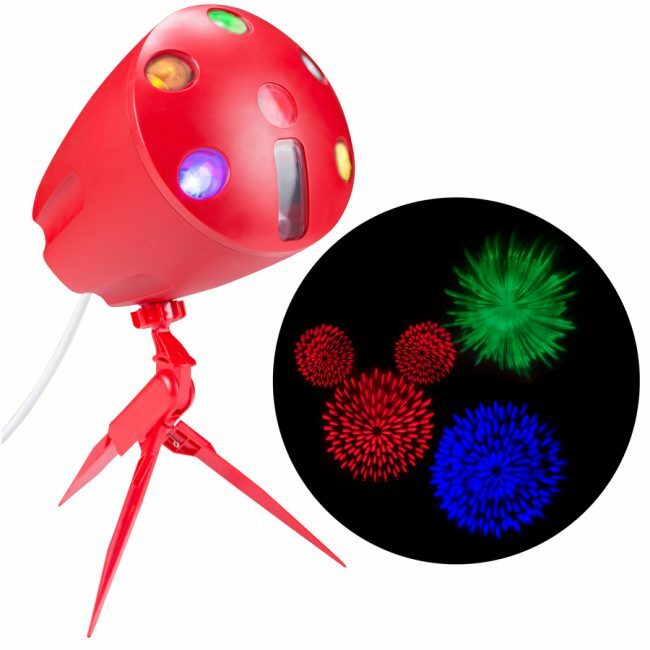 All the products look great – but my favorite might just be the fireworks projector!